Who’d have thought The Rock could get any more mountainous? Admittedly, he’s standing next to his pint-sized co-star Kevin Hart and the perfectly formed Karen Gillan, but Dwayne Johnson looks absolutely ginormous in the sneak preview of the Jumanji reboot. Almost too big to fit into a board game, if you ask me. Filming officially started yesterday on the Hollywood remake, set for release in 2017, and it sounds like The Rock has got a jungle-themed feast for the senses cooking. Kevin Hart, Johnson’s co-star and perpetual sidekick, also shared his excitement about the film on Instagram. But the cast have a hell of a lot to live up to. After all, the 1995 original starring Robin Williams (and a young Kirsten Dunst) thrilled and enchanted a whole generation of youngsters who are now utterly terrified of spiders and men wearing khaki. Needless to say, some devotees are more than a little concerned by Hollywood’s reboot, which looks to be a high-octane, action-packed, glitzy jungle comedy on steroids. The film – even with one image teaser – has already caused a stir among film fans who’ve been noting the female lead’s garments are far from jungle-worthy. 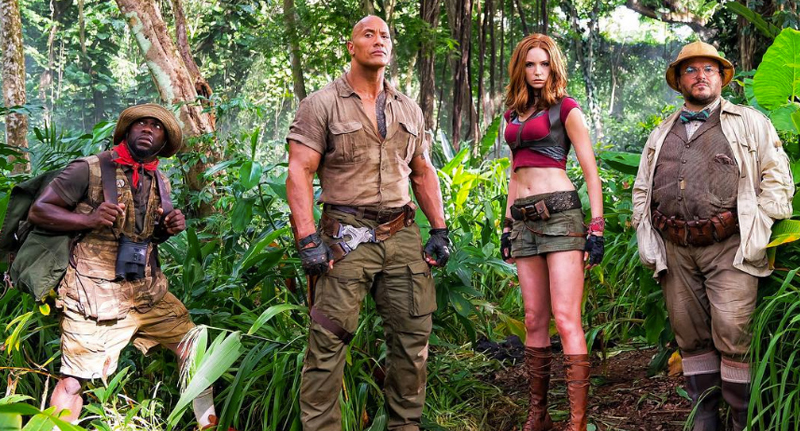 I vote that the next Jumanji cast photo has The Rock and Karen Gillan switching outfits. The Rock has defended Gillan’s wardrobe, explaining that it all makes sense within the plot… Just as much as Bryce Dallas Howard’s running heels were pivotal to the plot of Jurassic World, we bet. Let’s just hope Gillan bought mosquito spray. With all the hype around this movie, and the legacy of the original Jumanji, we’re sure the blockbuster will be a money-maker. Whether it’ll be any good or not remains to be seen. But frankly, it’s hard to imagine any comedic actor matching the charming performance given by the late, great Robin Williams.